Recently I posted about a new show on TLC called Extreme Couponing. I’ve also expressed how I feel it doesn’t show us couponers in a good light. Well unfortunately I read some shocking news that one of the contestants on the TLC Extreme Couponing Show may have committed coupon fraud. We all know that there are unethical and sometimes illegal ways to coupon. There really is a dark side of couponing. When I read about TLC’s Extreme Couponer Jaime Kerlew, and how she might have committed coupon fraud on the actual episode I was shocked. Jaime Kerlew awhile ago posted a couple of YouTube videos showing fraudulent couponing tactics at Target on some forums bringing a lot of negative attention. She did things like use Crest White-strips coupons to buy Tide, Olay Body Wash coupons on Secret deodorant, and so on. Jill Cataldo’s Blog has a post more in depth about how they think she committed coupon fraud on TLC. Very interesting read. On Jaime’s facebook page it looks like people are very upset as well over there. In fact she is being called all kinds of names and people are saying they hope she is arrested. She turned off the comments after the 213th even. UPC Coding is illegal and unethical couponing. It is when you would look at the barcode and if it matched the coupon would go ahead and use that coupon even if the coupon doesn’t list the correct product. For example Jaime may have used a $1/1 Buddig 12-16 oz size product coupon on the little 3 oz packages because the bar codes were the same. This is a crime and illegal. I know in the future the stores will be changing their UPC systems so as to avoid these kinds of problems. Make sure and follow the words exactly on all coupons. Also NEVER ever ever photocopy internet printable coupons or manufacturers coupons. Each internet printable coupon has its own unique tracking number so if you photocopy them the store will not get reimbursed for the duplicates. It is like stealing from the store as they have to take the loss on duplicates. Plus the coupons are also tied to your own IP address as well, which is linked to you and coupon fraud is illegal. Never photocopy any coupons. I know from reading a lot of your emails and comments over the years most of us couponers are good people who are just trying to do the best for our families. I know that most couponers are the most generous people in the world. That’s why its so hard to see a couple of bad apples painting all of us as either weird hoarders or sneaky and dishonest. Experienced couponers know there are many ways to commit fraud but I would never teach this or endorse it. There are just so many great deals to be had honestly! Feel free to add you thoughts to this this issue. You would think a channel call The Learning Channel would actually teach something with their shows. This “reality show” isn’t even close to the reality of couponing. I have had friends ask me how I have time to coupon with the hours of clipping and 5 hours in one store. I spend about and hour a week clipping coupon’s and checking the blogs. And five hours in one store just to grocery shop with coupons? Seriously? Who has this kind of time. To top it all off they are basically endorsing the misuse of coupons. Now the vision America has of couponers is that we are hoarders that clear the store shelves of all the mustard. I understand from a friend that one of the ladies on the show gets her coupons from the carrier before the carrier takes the papers to be recycled. I am the Oregonian dealer in the Hermiston area. I get audited each year at least once for the unsold coupons in my papers. I am supposed to dispose of them, I am not legally able to even donate them to churches or non profit organizations. I do however sell the returned unsold papers at a discount to people that coupon. I myself have taken coupon inserts out of the garbage can in the post office – these are in the garbage and are from papers that have been purchased already. I am just saying that it is not legal to just get them from unsold papers. Before I was selling the Oregonian I used to get coupons out of the recycling bins. I realize now this is a grey area because some of the papers there are unsold and some are purchased papers being recycled and basically the same as being in the garbage. My biggest problem as a newspaper seller is when people pull the coupon inserts out of the paper at the store and leave the rest of the paper in the stand. Really? I’m just glad she doesn’t live here in Tri-Cities, Just what we would need, more shelf clearers. Not! I agree with Susan above. I have slowed my couponing way down to what we need (for example, I don’t do near as many snack/sweets deals anymore) and we still have plenty. A large stockpile would just stress me out. All those expiration dates! I couldn’t handle it, lol! These people are obsessed! I love saving money on my grocery budget and it’s fun to watch your total go down when you’re at the register… but I will never let getting the “best deals” consume my life. I want my kids and husband to remember me as a wife, best friend and great mommy… not some coupon clipping/shopping obsessed psycho that hides my stockpile under my kids’ beds because there’s no more room in the garage/kitchen/pantry or wherever else you can hide stuff. It was cool to watch at first, but not interested in watching any more… especially after seeing someone possibly doing it illegally! I know…lol — too funny! I don’t have cable so I didn’t get to see the show. I am just disgusted from what I have been hearing about the shows to begin with since it makes all of us look like hoarders. Does anyone need 3,000 rolls of toilet paper? NO! If I’m going to go shelf-clearing, I’m donating it or it’s for something I can actually use like cat or dog food (3 cats, 6 dogs). No one mentioned the cashier in the blog. What the hell was the cashier doing? Apparently not their job if all of the coupons scanned for items that the woman didn’t purchase. It’s the cashiers job to look at the coupon and make sure the correct item is what is being purchased. Obviously, that didn’t happen and I bet someone is getting fired if that woman did indeed commit coupon fraud. It could have been prevented if the cashier checked each coupon and each item. My brother is a cashier at Wal-Mart. He follows policy 100% no matter what customer it might infuriate. This would not have happened if she was shopping in his line. I don’t blame the cashier or the woman since I don’t know what happened, but if she did commit fraud, that’s wrong. It’s also wrong that the cashier did not catch any of it. Watching the show has been cool as I have been doing this off and on for 2 years but to watch the youtube videos from Target. She isn’t being honest. Didn’t she say she was a paralegal on the show? Target in Kennewick is strict and who would have the nerve to keep asking the cashier to overide these products with the errors that kept coming up. OMG. I am unimpressed by this show as a whole.Unfortunately,there are people that are just plain greedy.to bad the producers didn’t do there research on these people beforehand. Sort of takes all the fun out of getting a good deal. Pretty low!. They give the word couponer a bad name. I, too, find the whole “extreme couponing” thing to be excessive–not to mention annoying. I was more irritated by the couponers on the show than impressed. Who on Earth needs 40 years worth of TP or more than 100 boxes of pasta?!?!? The attitude towards us at the store is bad enough already… imagine the impression of those who are just being exposed to this “lifestyle”. Ugh. I coupon only for products that my family will use and leave the rest. Dedicating two bedrooms to stuff and continuing to coupon on top of it points to a serious problem. 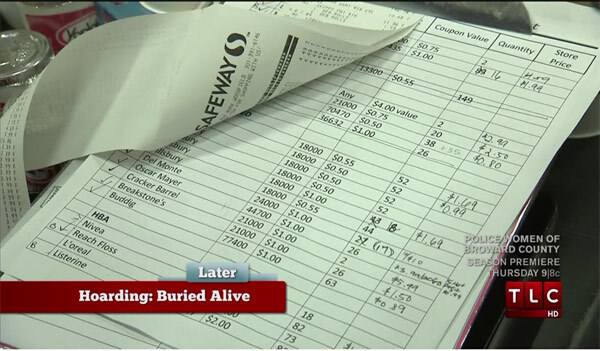 While this show is fun to watch I was also disheartened to see them show couponers in a bad light. When I was in line at fred meyers just last night both the checker and the lady behind me started commenting on the show. They did not have good things to say and in turn made me feel like they where talking about me. I felt like I had to defend myself and tell them I would never buy anything my family didnt need and I would never use my coupons (knowingly) in a fraudulent manner. And right after that comment the checker double checked what I had purchased with the coupon! I’ve been a couponer for years and it was fun and amazing to see what I could get for free or even make money at firist. I have since streamlined my shopping to get what my family needs until the cycle comes around again. Shopping this way has not changed my couponing budget at all, it just means my stockpile isn’t huge and I have less trips to the store and more time with my family. I personally think this show is similar to the hoarding shows which people are a little obsessed and I believe a healthy life is to have balance. YES! Thank you for this article. How people can brag about their couponing skills and doing it to honor God and their families, then turn around and STEAL (isn’t there a commandment against this?) is just sickening! I watched clips of the shows, and was disgusted! Never did get to watch the whole thing (dont’ think i missed much). Would love TLC to do a follow-up of Ms. Kerlow’s legal issues. I’d also like to see disclaimers added to the show about how these were individual results, and much is left to the checker’s / store manager’s discretion. I was appauled by most of the people on this show. I mean really just because you can get mustard for free or super cheap ( I can’t remember which ) do you really need to empty a full shelf. I did really like the guy who gave his free Total cereal to charity. I am also not surprised unfortunately that someone has been shown to be doing something illegal. Really is it worth going to jail to get some stuff for free or super cheap.